Meticulously well kept home in a quiet centrally located family neighborhood, yet close to pine island rd and veterans memorial pkwy with plenty of shopping and entertainment venues. The pool area is gorgeous with a brick paver deck and mature landscaping. Open assessments $6,642 as of 1/29/2019. Sandoval is a gated, resort style community w/in walking distance to trafalgar elementary/middle schools & cape coral sports complex. In the car you are just minutes from shopping, fine dining & entertainment. The community offers 4 lighted pickleball courts (pickleball club is active), 4 lighted tennis courts, 2 bocce courts (bocce club is active), horseshoes, basketball, sand volleyball, shuffleboard, playground designed by sandoval kids, disk golf, 2 dog parks, fishing pier on 22 acre lake, resort style pool, fitness center w/locker & showers, community center, 4. 5 acre calypso park & the esplanade offers a 2mi long, 8ft wide path for walking or jogging. This home has a huge backyard, master suite on the 1st floor, great room concept, soaring ceilings & lots of room for the family. 4 beds, plus den that could be a 5th bedroom, plus loft, 3. 5 baths & a 2 car garage. The kitchen is clean & well appointed w/ss appliance & dark wood 42in cabinets. The master suite is spacious despite the picture angle & offers 2 walk-in closets, 2 sinks & separate tub/shower. The home was built in 2011 & it boasts storm shutters, tile roof, 2 a/c units, gutters, large lanai & ceiling fans w/lights. Welcome to this tropical oasis. Great home to entertain friends and family. 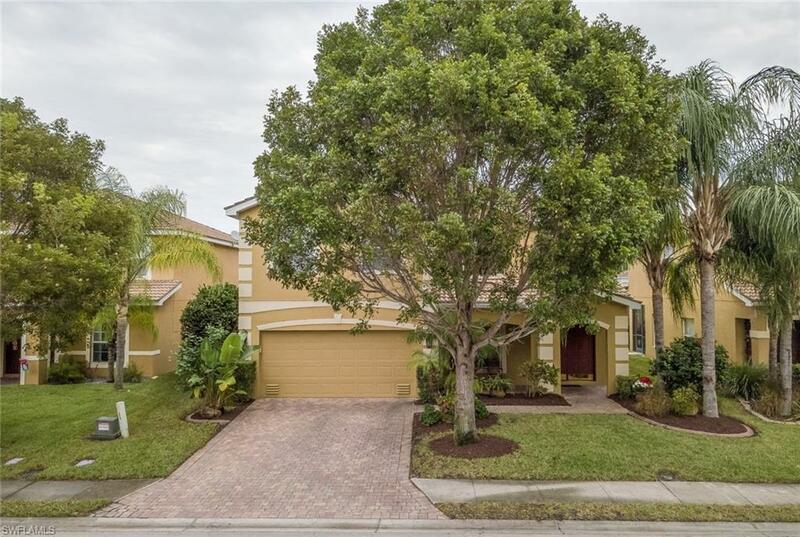 This beautiful 4 bedrooms, 2 bathrooms with cathedral ceilings in the living room area, includes complete paved backyard, a privacy wood fence and an intimate salt custom pool for low maintenance and expense. This outdoor space has a under roof area for a large outdoor kitchen and it is pre-plumbed and pre-wired. Kitchen features 48 cabinets and granite counter tops. Tile throughout the entire house. Newer: roof, a/c. Contact your agent to set up a showing on this one of a kind property! Price reduced, seller is motivated! Come see this beautiful home with 4 bedrooms, 2. 5 baths, 2 car garage with 2600 sq. Ft. Of spacious living area. Nice kitchen with 42 cabinets, granite counter tops, large island with breakfast bar and also a large pantry. Great floor plan with high ceilings and also a family room, excellent for entertaining. The home features 4 spacious bedrooms including an expansive master suite with his and hers walk-in closets, large walk-in-shower, garden style soaking tub and dual sinks with granite counter tops. House was just freshly painted. The screened lanai overlooks the large backyard. Sandoval is a family oriented gated community offering wonderful amenities like the lagoon style pool with slides, fitness center, playground area, tennis courts, basketball courts, volleyball courts, bocce ball, 2 dog parks, community center and endless walking or biking trails with low hoa fees that include internet and cable. The location is great, within walking distance to surfside shops, restaurants and also close to veterans pkwy with easy access to fort myers. Seller is offering an incentive to buyer and a hms home warranty plan! Dont lose out! This brand new 4 bedroom, 2 bathroom, 3 car garage, fresh water canal home can be yours and will go fast! Experience year-round florida lifestyle by fishing and boating right in your own backyard. Enjoy breathtaking sunsets and sunrises from this location. With 4 bedrooms, every member of your family will enjoy their own space. All will love the professional design and color palette which flows through the home. Additionally, the 3 car garage provides extra room for your vehicles, motorcycles, tools, toys or workshop. This home features: real wood cabinets with crown molding and soft close feature, granite countertops, lazy susan corner kitchen cabinet, glass subway tile backsplash, stainless steel appliances, wood lvt flooring in main area, carpet in bedrooms, tray ceiling, under truss screened-in rear lanai, huge front porch with railing, upgraded landscape package with irrigation system, real tile in showers with decorative inserts, ceiling fans and light fixtures in every room. This house is waiting for you. We already have the welcome mat out. Come see this house, fall in love and make it yours. Bank approved short sale, and is subject to the lenders approval process. This is a rare find 4 full bedrooms + a den which can be used as a downstairs master bedroom with the adjacent bathroom, additional upstairs loft / family room, home features 3 full bathrooms. Sliders that lead you to the over-sized covered lanai and paved poolside. The tropical pool is over-sized and features a sun ledge and water fall. Gourmet kitchen that any chef would be happy to entertain with features oak wood cabinetry & corian counter tops with tumbled marble back-splash & large bar island. First floor features full downstairs bathroom , pool view from the living area 4 large second floor bedrooms with closet built ins including master suite that share bonus flex room loft that can serve as office, or exercise/video/gaming room. Master bathroom features level 5 granite counter tops and built in california closets. Brand new dual ac units from bruno air in 2017 and dual nest thermostats. Needs some maintenance but a real gem of a property for the price. One of the largest lots in the development. 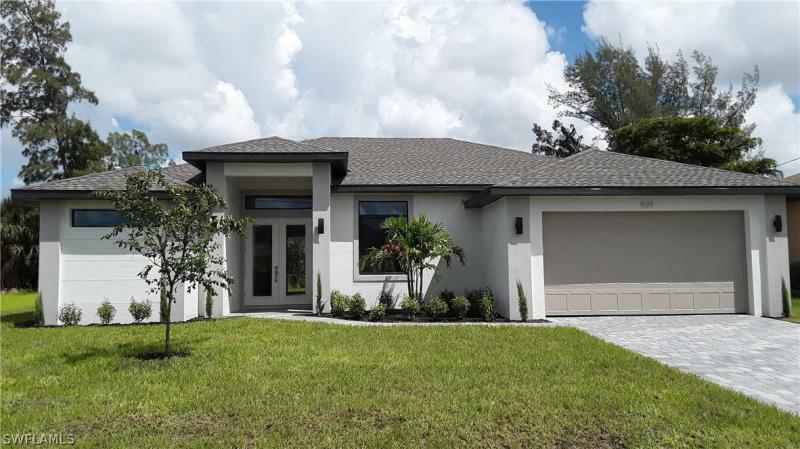 New construction on wide open canal, luxurious modern home with plenty of room for a pool in sw cape coral. This home is impeccably designed and built with attention to every detail. The open floor plan seamlessly blends indoor & outdoor living. Double entry doors welcome you into the light and bright interior. Expansive living room with high tray ceilings with beautiful crown molding. The kitchen boasts gorgeous 42 solid wood soft close cabinetry with granite counter tops, a broad counter height island, marble backsplash along with a stainless steel appliance package. The master suite welcomes you through the 8' doors (found throughout the home). Large shower, his & her sinks with make up area and walk in closets with ventilated wood shelving, tray ceiling, ceiling fans (throughout the home). The guest bedrooms are large with tall ceilings and ample closet storage. Beautiful brick paver driveway and front walkway! Lanai with custom pavers, plumbing and electrical connections for outdoor kitchen. Lush landscaping with auto sprinkler system. This home is close to shops, restaurants, boating and the best sw florida can offer. A holiday builder home, charleston model: beautiful floor plan with high ceilings futures split bedrooms, 2 rooms in the front for formal dinning and office or extra space for anything you need. 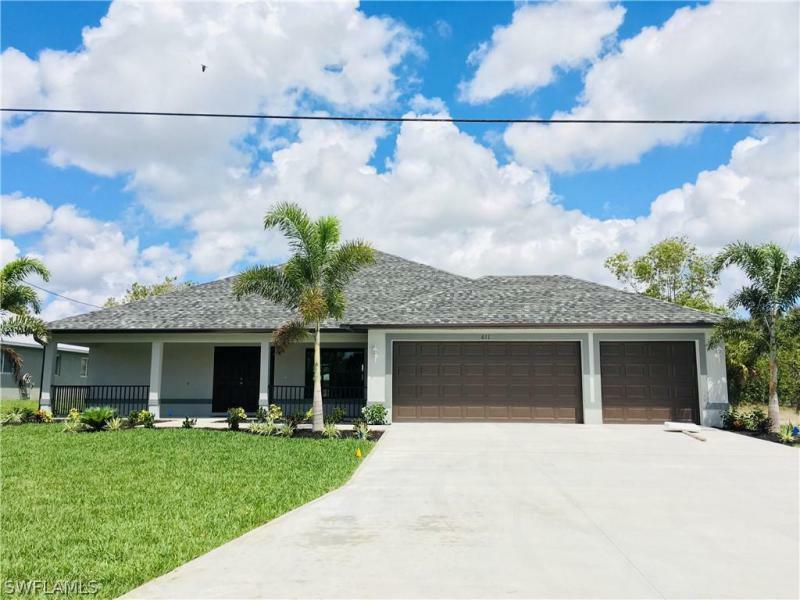 4 bedrooms and 3 full bathrooms, screened lanai, 2 car garage, kitchen has all appliances, granite counter tops, and beautiful kitchen cabinets, this home is located is a fast growing area of cape coral. Experience the dream! Located in the family-friendly heatherwood lakes community. This large 2,909 sq. Ft. , 2 story home boasts 4+den, 3 full baths and a 2 car garage. Loved and maintained by the original owners this home features a formal dining room, family living room, a large kitchen with stainless steel appliances, double oven, updated solid surface counter tops and back splash. The den and one guest bathroom is located on the main level with tile and wood laminate flooring which gives you plenty of space to entertain! The 2nd story has a large loft area with new laminate flooring. The master bedroom is very spacious which includes a sitting area with his and hers closets. Your attached master bathroom has been updated with a beautiful shower, soaking tub and dual sinks. You will enjoy the other 3 over sized guest bedrooms along with your second guest bathroom. The home was fully repainted and ac handler was restored and cleaned in 2016. After a long day, unwind on your extended lanai overlooking your large backyard and peaceful lake. This community has 159 homes, 6 beautiful lakes, tile roofs, brick paver driveways and a community pool with play area. 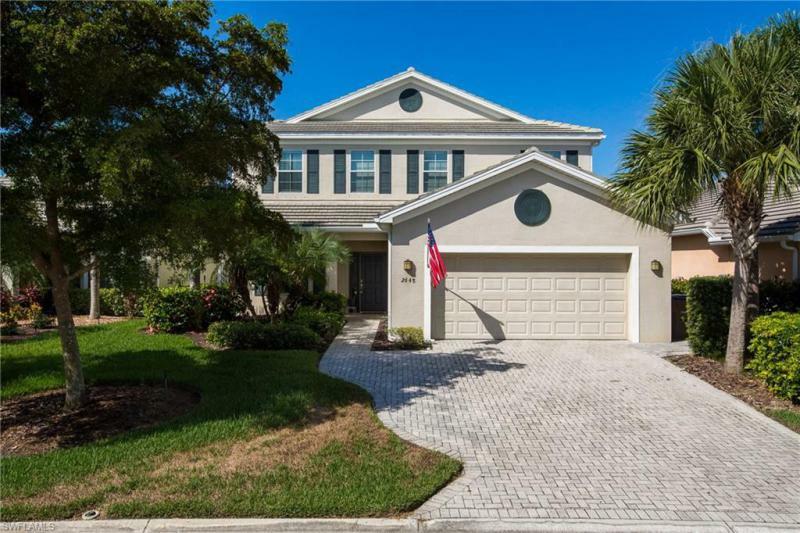 Updated home on freshwater canal! Great location w/large fenced in yard for kids and furry friends, decorative curbing, and a variety of colorful shrubs. Your entry door welcomes you to your formal living and dining room w/hardwood flooring throughout main living area w/vaulted ceilings and sliding glass doors where you get your first taste of the amazing water views! Beautiful raised panel kitchen cabinets w/granite counter tops, large stainless steel farm sink & appliances with gorgeous pendant lighting. Your newer kitchen over looks the family room and living room for the best family and friends entertainment. Lots of space w/over 2200 sq ft of living area, 4 br, 2 baths and 2 car garage. Outdoor living environment was made for enjoyment from your screened in lanai canal views. Finally, this home is nestled in a mature family community w/quick access to shopping, dining, hospital, schools, i-75, midpoint bridge to white sandy beaches and beyond. This would be perfect for a growing family, 2nd home away from brutal winters and vacationers alike! Come see for yourself you deserve the sw fl living! Assessments in and paid! Call today for your private showing!